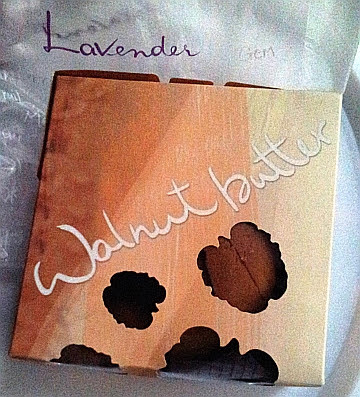 After reading about PH's delicious Butter Cake, I went and bought a Walnut Butter Cake (MYR18.50 nett) from Lavender. 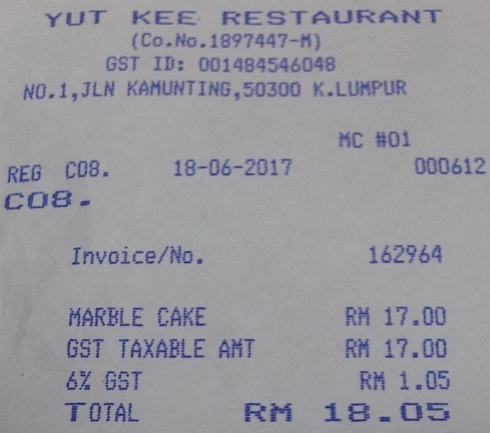 Then as I was in the vicinity of Yut Kee, I went there to buy a Marble Cake for MYR18 nett. Yut Kee's marble cake. 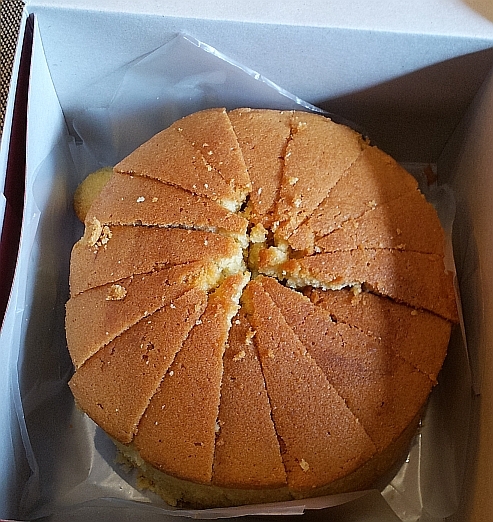 It is a traditional marble cake, eating it transported me to my childhood, to the time when I was eating the marble cake baked by my mother. Very tasty, not very sweet. I gave half of each cake to my friend. The marble cake is taller than the walnut butter cake. The walnut butter cake is tasty but a bit too sweet for me so I think I will stick to the marble cake next time although I seldom venture into that area where Yut Kee is located. They gave me a 5 cents discount which is quite nice of them as I do not have a 5 cent coin with me and I don't want to end up with 95 cents worth of coins in my pocket. Lavender is famous, very popular but at times, such places are overrated. The reputation precedes all else - some may be better but are less well-known. Can find Lavender at almost all big malls so it is convenient too to buy from them. So accessible. I think your daughter will like the bread and pastries from Lavender. 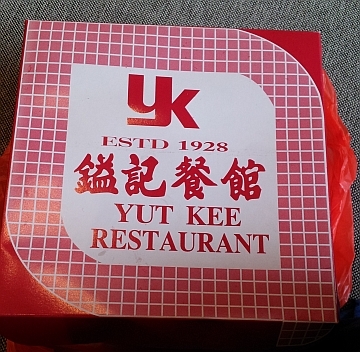 The cake from Yut Kee was hot out of the oven when I got it. 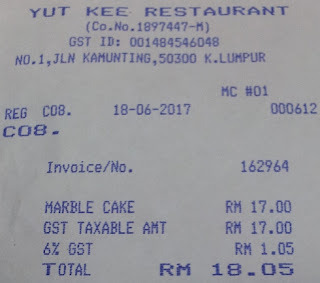 till now I haven't try Yut Kee marble cake. 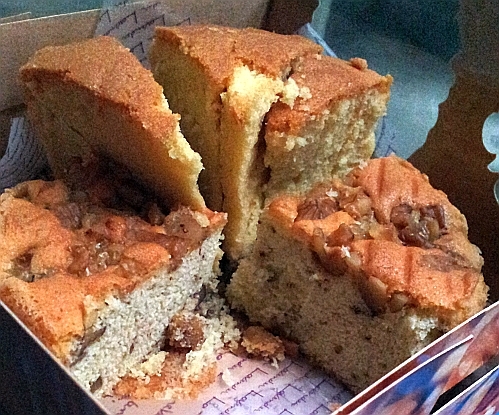 But yea, eating marble cake reminds me of my grandaunt who used to bake cakes to give away during CNY. Only if you are in the area go and try. Oh, thanks for the mention hee..hee... Glad you got to enjoy two types of butter cake. But I believe your butter cakes taste much better than them. Please let me know when you decide to take orders for your cakes. I have eaten butter cakes or any cakes for a long time. Both cakes look good. Have a great day! thanks. may you have a great day too. for health sake one slice of cake a day should be more than enough. i think i have bought one of their mooncakes previously. It is true that these cakes were around and popular during our childhood days. We often saw such cakes being sold in coffee shops too. i believe you know how to bake butter cakes too, right? Bet the cake from Lavender is smaller than the YK one. I like the YK one a lot too, my fav item there. diameter is the same, just not as tall.